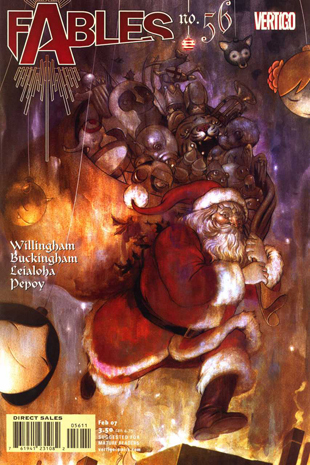 A breather episode that takes place just before the beginning of Fables' mid-run climax, Jiminy Christmas sets out to answer the most pressing question of the holiday season: just how is it that Santa can deliver all his toys? I'll skip the recap, except to mention that the children of Bigby Wolf and Snow White learn that if they catch Santa in the act of delivering gifts, he has to answer one question. They plot to do just that, and thus we learn that Santa basically has the ability to exist in multiple (possibly infinite) places simultaneously. Freaky! But the kicker is that we then see that at the same time he's answering this pressing question, Santa is also visiting all the other characters in the Fables universe, including Ambrose, also known as Flycatcher, the former Frog Prince who still has no memory of what happened to his dead wife. (Spoiler: she died horribly, Flycatcher witnessed it, and his amnesia is a coping mechanism.) Santa's gift to him is to permanently rob him of his ability to forget, then inform him that he has an important, possibly life-threatening role to play in some very dark times ahead. The issue is heartwarming, kind of depressing, imaginative and ultimately the setup for some significant and horrific violence. So, basically it's exactly like Christmas in the real world. Not bad!